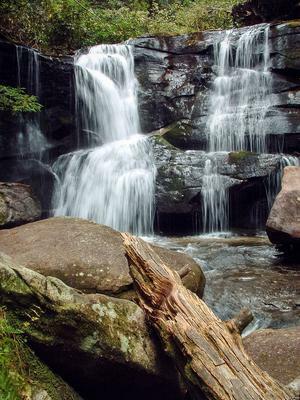 This hike takes you past a small but attractive waterfall, up to the top of John Rock, which is the large mountain you see looming behind the Fish Hatchery parking area in Pisgah National Forest. 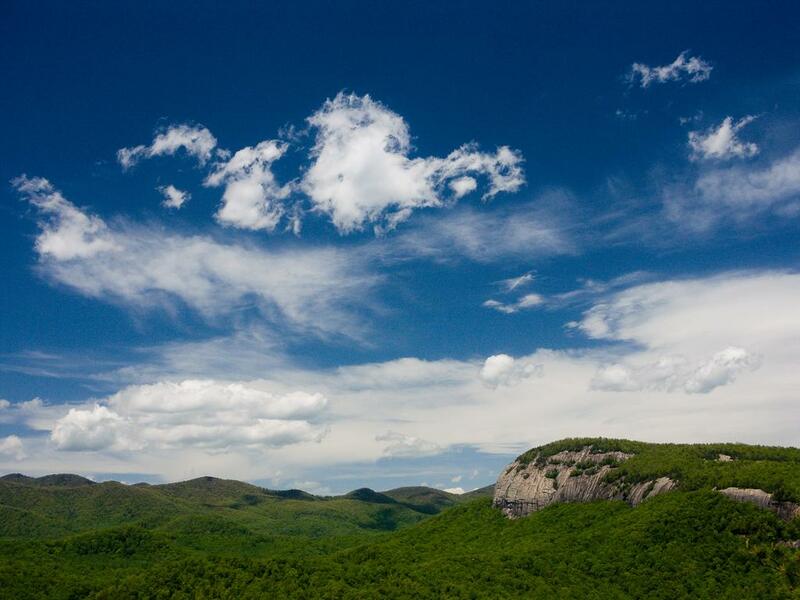 Views of the valley below, up to the Pisgah Ridge, and across to Looking Glass Rock are this hike's main scenic attraction besides the waterfall. It also passes by tranquil meadows near Picklesimer Fields, and through some nice displays of wildflowers in the spring. 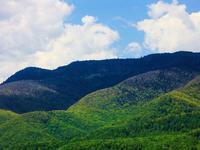 From Asheville, take I-240 west to I-26 east to the exit for the Asheville Airport (exit 40). Turn right onto NC 280; follow this 4-lane highway for 16 miles toward Brevard. 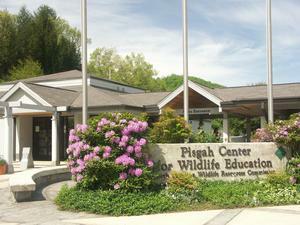 At the intersection with US highways 276 and 64, turn right onto US 276 west (follow signs for Pisgah National Forest). Follow US 276 for 5.2 miles; turn left onto FR 475. Go 1.4 miles to the Center for Wildlife Education and Fish Hatchery. Turn left, cross the bridge and park in the parking lot. 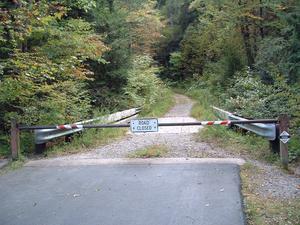 Begin the hike by following Forest Service Road 475C out of the parking lot. It's to the left as you face the main building. Go around the gate and immediately cross a stinky creosote-soaked log bridge. Immediately past the bridge, turn right onto the Cat Gap Loop trail. This trail will get your blood pumping from the start, with a climb up some log steps, but it soon levels out to a gently rolling grade. It lies just outside of a forest demonstration area delineated by a green chain-link fence on your right. Look inside the fence to see the last remaining healthy hemlock trees in the area (they've been treated with insecticide; many of the rest on this hike are dead). The trail will cross one small tributary, which you could formerly rock-hop easily without getting wet (but has been getting wider and muddier over the years). The forest here has many different varieties of trees: cove hardwoods (namely tuliptree and oak), white pine, shortleaf pine, (formerly) hemlock, and more. In places there is an extensive ground cover of Lycopodium - also called "ground pine" and "running cedar". Ground pines are some of the oldest varieties of plants in existence, and they used to dominate the landscape with tree-sized forms. Now diminutive, this cute little plant looks like a 6 inch high forest of its own! The spores of this plant are very flammable, and were once used to make flash bulbs for photography. 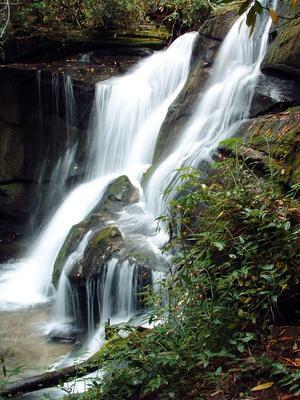 Cedar Rock Creek Falls as seen from the approach side. You'll come to a footbridge over Cedar Rock Creek; cross it, cross the gravel road just after it, and pick up the Cat Gap trail again on the other side. A short, moderately steep climb takes you up to an old roadbed. 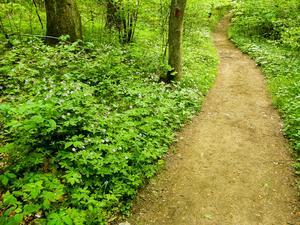 From here, the trail becomes a wide, eroded path that gradually gains elevation up along the side of the valley. You will pass the weir where the water is diverted into the fish hatchery, far down below you on the left. 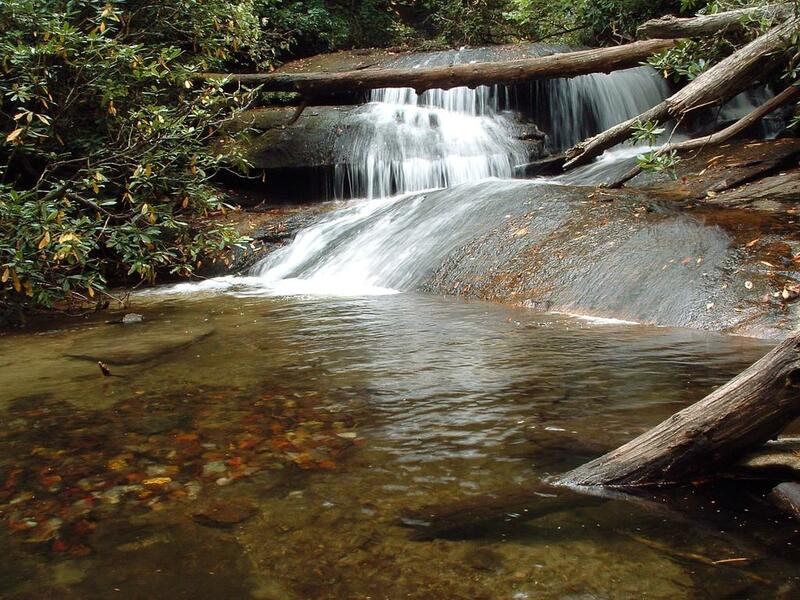 The cold, clear waters of Cedar Rock Creek are perfect for raising the trout in the hatchery. 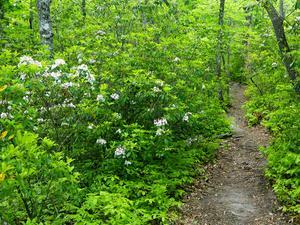 At times, rhododendrons arch over the trail forming a "tunnel". You'll pull away from the main valley and head up a side cove, then cross a very low ridge. Soon you'll start to hear (and see, now that the hemlocks are dead) Cedar Rock Falls on your left. The trail will pass a nice but overused campsite with a small cascade beside it; the main falls are just downstream. Continuing on the Cat Gap Loop trail past the campsite, you'll reach the intersection with the Butter Gap trail, at a big rock slab in a grove of surviving (as of early 2019) Eastern Hemlock trees. This hike goes left across the bridge, remaining on the Cat Gap Loop, but you may wish to explore to the right a bit, which is a relatively open area known as Picklesimer Fields. It reminds me of a mini version of the nearby Pink Beds area, with slow, meandering streams winding through shrubby and open areas. Sign and newer log bridge at the start of the Cat Gap Loop trail. Back at the rock slab, Cat Gap Loop goes left across a log bridge with a cable handrail, at the point where the lazy stream starts to drop out of the level valley bottom and over the falls. You'll then begin heading upstream through the southern arm of the valley along Cedar Rock Creek. I saw a rattlesnake not far off the trail here in May 2013 - this is definitely the type of area they like to hang out, so keep that in mind. The trail crosses the creek again on another log bridge and comes out in a planted stand of white pines where there is almost no undergrowth. This makes a popular campsite. The trail continues to the left, upstream. The trail will cross the creek again. This time, it's a rock-hop, but this crossing has been widening over the years and is now a muddy mess. Past the crossing, the trail becomes significantly steeper. It angles to the left (east) up the mountainside and works its way up onto the nose of a ridge on a very eroded section of path. The trail ascends the unnamed ridge via a few switchbacks. Footing is generally good, though there is still some erosion, and a there are a few rooty and rocky sections. The trees become older, and you'll be traveling through a mixed hardwood forest typical of these sloped areas at this elevation. 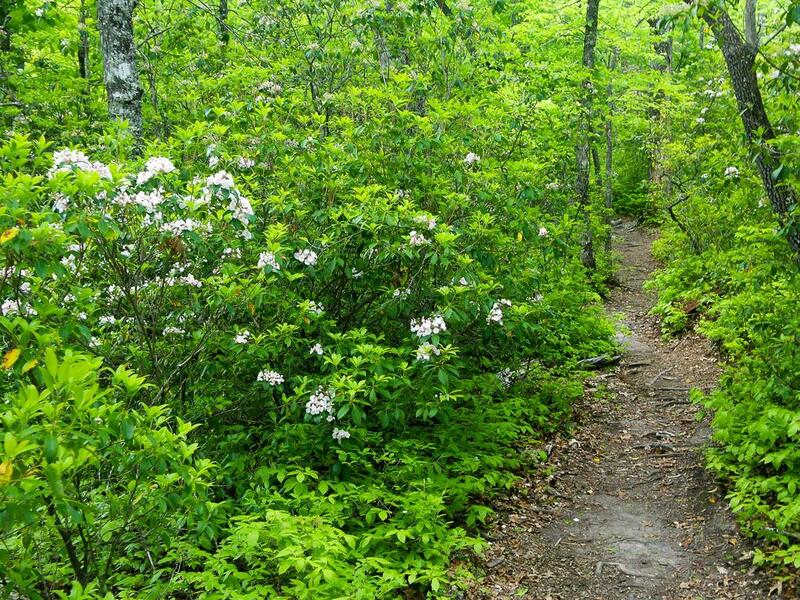 The thick understory of mountain laurel and rhododendron would make traveling off-trail here extremely difficult. It also poses somewhat of a fire hazard. Since the era of fire suppression, undergrowth like this has become much more common. The Forest Service sometimes use controlled burns to reduce fuel loads and open up areas such as this. Nature uses wildfires to do the same thing, but in a much more dramatic, uncontrolled fashion. As the climb begins to de-intensify, you'll reach the intersection with the Cat Gap Bypass trail. Turn left here onto the Cat Gap Bypass. 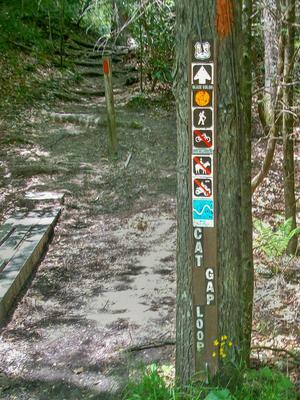 (Straight ahead, the Cat Gap trail climbs to reach the Art Loeb Trail northeast of Cedar Rock Mountain, in Cat Gap). Cat Gap Bypass traverses a high slope below Cat Gap, at the head of John Rock Branch at about the 3100 ft elevation mark. 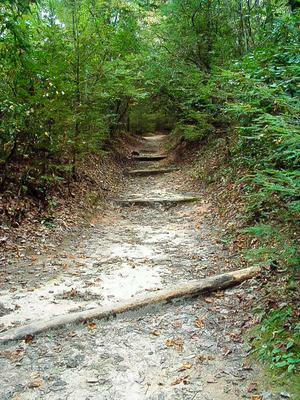 It provides a much easier, shorter, and faster way to reach the John Rock trail than going up and down through Cat Gap. You'll pass through varied forest environments in rapid succession. As you go out around ridges, look for mostly oak trees. When you dip into the small coves you'll find tuliptree and (formerly) hemlocks. In the wintertime you can catch views of the side of John Rock through the branches. You'll come to a four-way intersection in a deep gap to the south of John Rock. Turn left here onto the John Rock trail. (To the right is the other end of the Cat Gap Loop trail as it comes back down from Cat Gap and the Art Loeb trail. Straight ahead is also the Cat Gap Loop, which promptly descends into Horse Cove). The John Rock trail begins a steep climb up to an unnamed knob along the ridge leading out to John Rock. It could afford some switchbacks, or even to skirt around this knob entirely. But for now, watch your footing as the trail is rocky and deeply eroded with roots crossing the trail, suspended a foot or more in mid-air in places. One portion is a steep climb up a jumbled rock pile. Fortunately, the rough section of trail is short-lived. After reaching the top of the knob, you'll start gradually down again toward John Rock. This is the highest point on the hike, at approximately 3320 ft in elevation. 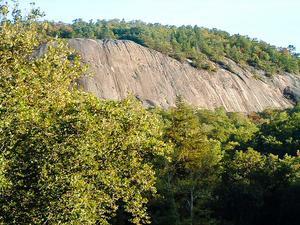 The trail will proceed up and down a few times as it nears the cliffs on John Rock. You'll reach a T-intersection; the yellow-blazed John Rock trail turns right. But continue straight ahead to reach the overlook. The trees become smaller and disappear right before you pop out onto the face of John Rock. This goes without saying, but: be extremely careful here! It's a 200 ft sheer drop to the rocks below. 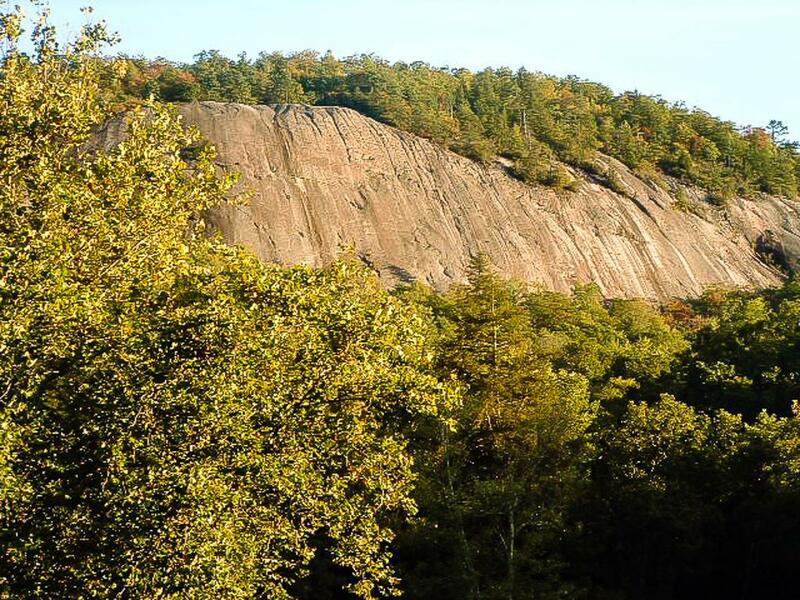 It's not unsafe to enjoy the view from the edge of the forest if the rock is dry, but watch out for wet rocks and slippery things like leaves, pine needles, moss, and algae which could send you sliding downhill! 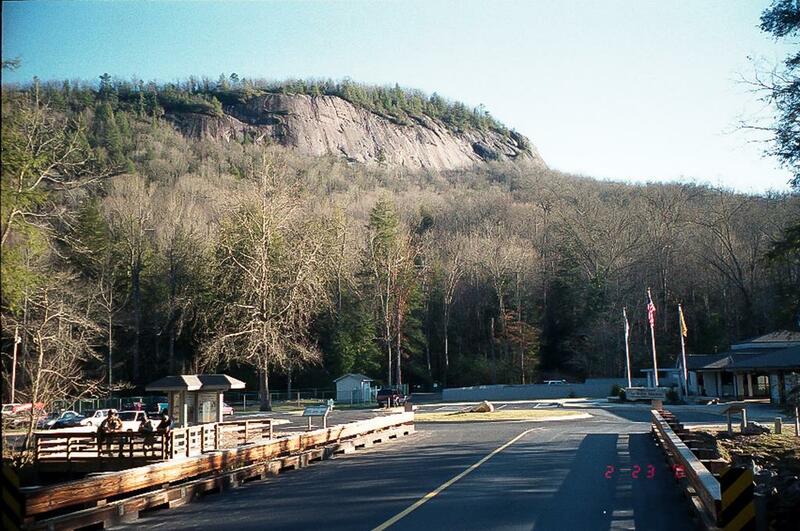 View of Looking Glass Rock from John Rock. 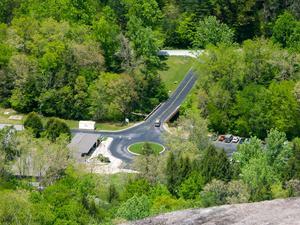 Enjoy the view north across the valley of Looking Glass Rock and of the Fish Hatchery below. Bring a pair of binoculars and see if you can pick out your car in the parking lot! 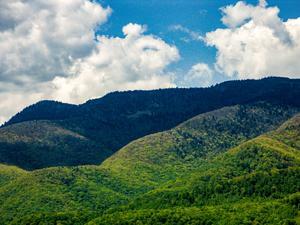 To your left (northwest) is the Pisgah Ledge and all the ridges extending off from it. Just to the right of Looking Glass Rock (northeast) is Coontree Mountain, and to the right of that is Bearpen Mountain. After you're done soaking up the views, head northeast along the edge of the woods to the right, and pick up the trail again heading downhill. This is the continuation of the loop, and it heads in a generally southeastern direction. 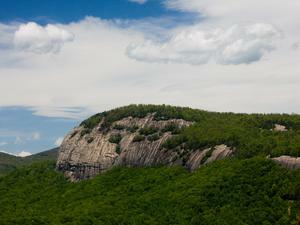 You'll pass through a large, gently sloping area to the east of John Rock, where the trail winds around a bit. Then it drops downhill slightly into a cove filled with a dense undergrowth of rhododendron and mountain laurel. From this cove, the trail begins winding back uphill again slightly, over into the next cove, where it starts to descend in earnest. You'll bottom out at a crossing of Horse Cove Creek on a sketchy log bridge; on the other side you'll reach the eastern intersection with the Cat Gap Loop trail. Turn left, downhill. The lush forest in this area is dominated by tall, straight tuliptrees, one of the most common Cove Hardwood species. Dark, lacy hemlocks used to grow in the shade of the tuliptrees here, waiting paitently for a chance to dominate the canopy some decades into the future, but unfortunately, they are narly all dead now. This cove sports a spectactular spring wildflower display. You'll reach an intersection with FS road 475C; go straight across and continue on the Cat Gap Loop trail downhill to another stream crossing. This time, it's a rock-hop. Wildflowers bloom beside the Cat Gap Loop trail in Horse Cove. Horse Cove starts leveling out near its confluence with East Horse Cove; then the trail will pass out of the mouth of the cove and begin heading upstream beside the flat, gently flowing Davidson River. Although you are climbing gain very slightly on this section of trail, you'll hardly notice it compared to the rest of this hike. This section of trail is on the north side of John Rock; the area is wet and several small tributary streams and seeps pass beneath the trail to join the river. Rhododendron and doghobble grow thickly in places. Once dominated by cool, dark hemlock trees, this section of forest is returning to a place of cove hardwoods, with just a few scattered mature hemlock remaining alive as of early 2019. Near the end of the hike, a large, once-attractive campsite opens up to your right. (Dying and falling hemlocks will make this on a bit less than ideal for a while). It's also a great spot to relax by the river at the end of a great hike. 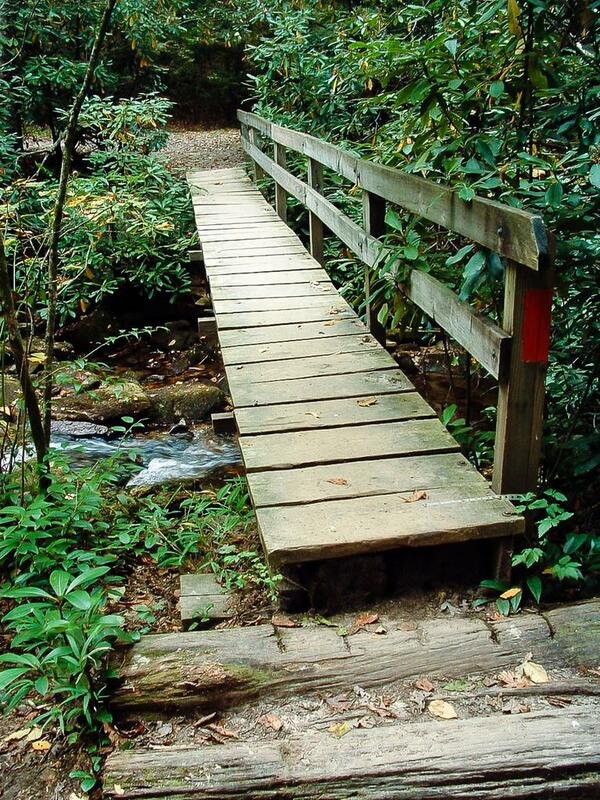 Finish the hike by crossing the last unique triangle-beam bridge over Cedar Rock Creek. In just a short distance further, you'll come out of the forest at the eastern end of the Pisgah Center for Wildlife Education parking lot. Tracey said: Hiked this trail today - decided to take the cat gap loop - I cheated slightly and about half way in hopped on the john rock loop which is a quicker yet steeper trek to the "summit" beautiful view of looking glass. 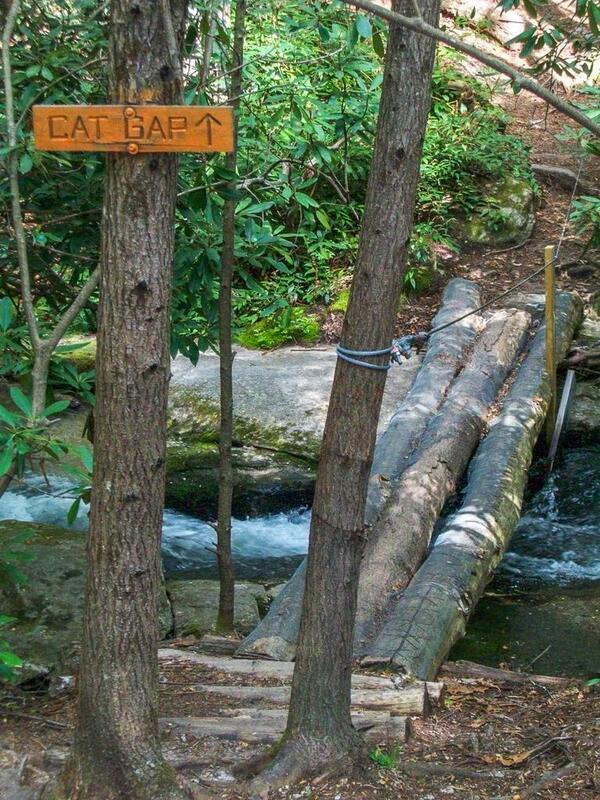 I recommend looking glass over this trail if you have to pick. Some great waterfalls if you follow some bushwacked paths. Someone said: The hike was great, and it was pretty easy to follow the directions above! It took us about 3 hours to hike and total distance was 6.4 miles. I'm not sure how someone got over 8 miles above, it must have been a longer route. For what it's worth, the Cap Gap Connector is labeled Cat Gap Bypass on the trail. Additionally, after the steep climb to the highest point it's a good 10-15 minutes until you get to John Rock. When leaving John Rock, we walked down the rock and to the right along the tree line... that's where a spur of the trail picked up again. KBEAR said: Just did the loop today for my birthday. What a beautiful hike!!! Not too challenging really. I like the short step climbs as I'm not such a switchback fan. I'd rather climb the climb straight on. Plenty forgiving rolling hills and saddlebacks. I had an interested critter (deer or bear) follow me for about 20 mins. Started at 7:30, back to car by 12. That rock scares me. I'm not cool w heights so... But I sat there for a while. YOLO, right? I too followed the instructions on this website and didn't have a bit of trouble. What a treasure the Pisgah Forest is and what a gem this hike is within it. Bless it. Helen said: I don't know where the 5 mile measurement comes from. My app picked up 8.11 miles with a slight sidetrack onto Butter Gap. Sidetrack no more than .1 mile. Falls and cave are beautiful and it's worth the hike, but it is much longer than advertised. We are well and truly tired. The views are amazing! I will do it again, but not every weekend. Tough on the old knees. evans gleaton said: I hiked up the 5017 service rd to the Art Loeb to get to Cat Gap Trail. Passed going the other way two ladies with their small dogs, walking off leash. Further up the trail a coyote ran out of the brush towards me, spied me and turned tail the other way. The critter was tracking these two little dogs as potential meals. Be careful with your pets, people - - this predator would have frightened one of these dogs to run off trail, and there would have been nothing these ladies could have done to save their four legged companion. Coyote just being a coyote. Natasha said: I omitted to add that it took us about 5.5 hours to complete this hike - that was including one extra mile (accidentally added on when we back-tracked! ), but also included ample time at both waterfalls, the forest (which was my favorite part - I wish that we could upload pics with our reviews) and of course the vista up the top. Natasha said: JAN 2016 hike: I really loved this hike - as has been mentioned it offers a little of everything: forests, brooks, waterfalls and fantastic vistas. The directions for this loop were excellent....until the part where you reach the highest point on the hike. The directions (to me) sounded as if the walk down from the highest part to the view of Looking Glass as close by, and it's not. It took us at least 10 minutes from that point and we even double-backed on ourselves believing that we had somehow missed the view. My tip to you is that if you see a tree with a big oval hollow (on left hand side, if you start the trail from the point as listed above), then you have gone too far. There are a few parts to get a view of Looking Glass, which is outstanding (and that is a hike worth doing also), but be very careful, especially if you hike this in the Winter, it was incredibly icy at the view point. 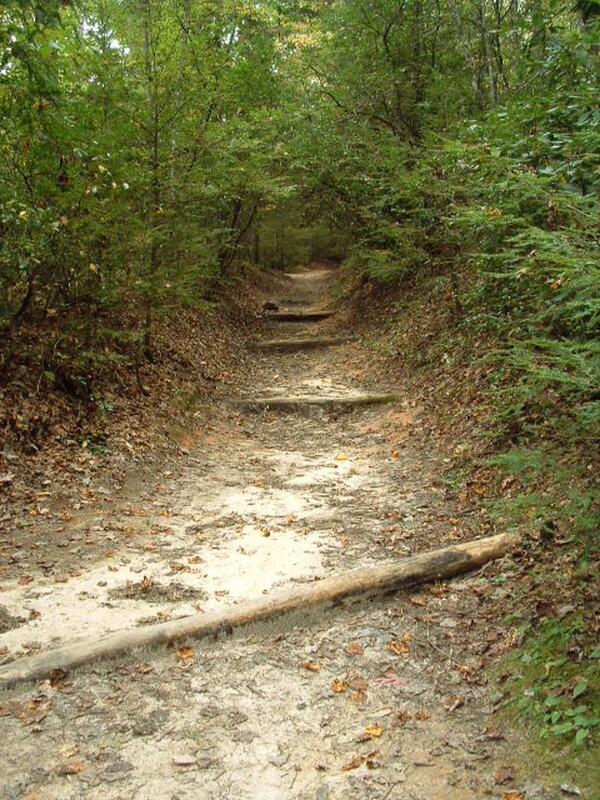 Kristen said: Could anyone tell me an average time it takes to complete this 5 mile trail. We're pretty used to hiking hilly terrain at Warner Parks here in Nashville. A 4.5 mile with some steep hills takes us about 1 hour 20 minutes. However I may be totally underestimating NC terrain. Thank you! John Jenkins said: Does anyone have any information on camping along cedar rock creek? Do I need a permit? How crowded does it normally get? Kathy, Bill, Jim, and carol said: We had a great hike on the trail today. We started on the way to Johns Rock and then headed down to the waterfalls and bypass. We never really saw the water falls, but did enjoy the easy hike on the biomass trail to the hatchery parking lot. We figure we did about 9 miles and enjoyed most of it. The view from the rock is amazing and we worry about people who take dogs (or stray children) up there without guidance. Great day all in all but one needs to be ready for a long walk and a challenging climb. steadysnacks said: This hike is so beautiful from beginning to end. I followed the instructions above and did not get lost, although there are several points where you could take a 'wrong turn' and lengthen your over all trip. I highly recommend taking the short side trail to the waterfalls. With all of the rain we have had, it is worth it for sure. It isn't marked, but you can hear it when you are close by and it is a skinny trail at some points, but just keep going and you will see it. At the top, I would keep you dogs on a leash and your eye on your children as you arrive to a beautiful view and a steep drop off. Sunning yourself on the rock face and eating lunch makes it all worth the climb. Lupperrrrr said: This is a great hike. I have been on it multiple times and loved it. If you bring a dog, please keep it on a leash as my dog sliped of the rock last christmas. Jeremy said: Well I did the trail backwards and came back the same way until I got to the service road and took the road back to the parking lot. I saw the beginning of the trail at the end of my hike. I took my dog, keep your dog on leash when going near the steep slick parts. I will go again and see the rest of the trail. Alice said: Hiked loop today. The switchbacks almost got to me, but I kept going and was not disappointed. The view is fantastic. There is one adjustment to the trail. At the intersection with Butter Gap Trail you now turn left across the stream on a foot bridge and continue following the orange blaze. Looks like beaver activity may have dammed one of the streams and water is blocking the trail as it goes straight ahead at the intersection. I will be hiking this one again and again. 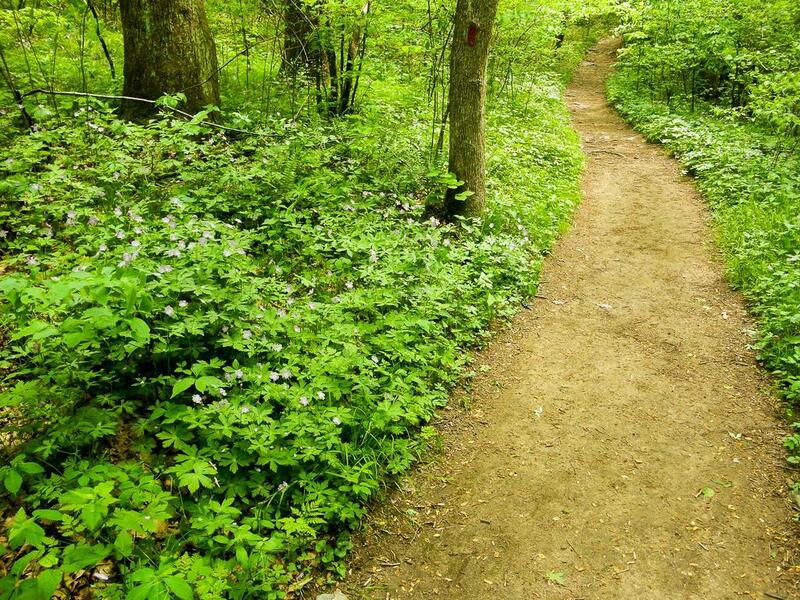 WickedGood said: One of my favorite trails. We hiked it in late winter and the views were still awesome. It was a nice warm day and we took our lunch and ate on the rock itself and soaked up the sunshine. Lots of people visit the first mile of the trail but we didn't pass anyone once we started the ascent.